I feel like we just got unpacked from our 4th of July trip to the lake and now we’re getting ready to pack up again to take the boys to Toronto and Niagara Falls. It’s a pretty easy and casual trip, plus we’re driving, so no need to overpack right? More like, “yeah, right!” I’m pretty sure that the only way I pack is to overpack these days, but my goal for this trip is to lighten up, only take what I REALLY think I’m going to need and not overdo it. Wish me luck. When it comes to packing for a road trip, I usually do a separate bag for beauty products and inside that I sort my things between a makeup bag, plastic bag filled with hair products and a skincare bag (plus all the hair brushes and tools I take with me). One thing I’ve been doing to lighten up this bag is to simplify my travel skincare. It can be so heavy to travel with and I find that even if I think I’m going to do a mask or some sort of treatment when I have a “break” on vacation, I really never do it. I also used to collect samples from all of the department story beauty events and gifts with purchase and those would come with me. This is truly not a bad idea (if I do say so myself), but the storage of it all for those “just in case” moments got to be a bit much, so I donated a lot of those things and went for a different solution. I’ve worked with TULA a few times for blog projects and, around the holidays, found that they have some really fantastic starter sets. Not only are these a great way to try some of their products, all of which I’ve always liked using, but they’re perfectly travel sized, TSA-friendly and they’re designed to last 30 days – so whether you’re using at home or taking on a few vacations, you’ll be stocked up! I wanted to also just quickly highlight that the bags that their sets come in are also really nice! I’ve used one for a jewelry bag on a photo shoot, as well and it works great. I’m sharing two of my favorite travel skincare sets today, both of which you can get at 20% off when you use the code NINARAND. Although the products will last for much longer, I think this kit is a great one for summer weekend travel! The Purifying Cleanser is a great gentle cleanser (this is my favorite cleanser to use with a Clarisonic when I use one), and the Pro-Glycolic Resurfacing Gel and Oil-Free Gel Moisturizer are both light and will keep your skin clear and lightly hydrated. Now you know how I mentioned that I try to leave the masks at home? This kit comes with one! The Exfoliating Treatment Mask is one that I actually use in the shower, so it won’t take extra time away from your trip, but will make you feel better, especially if you’ve spent a day covered in sweat and sunscreen! If I was going to add one thing to this kit, I’d also buy the Multi-Spectrum Eye Renewal Serum (also here in travel size). It’s a good product because it’s cooling and soothing, and I feel like it de-puffs really well. It’s great for after a flight or to calm down the effects of a little vacation dinner indulgence! This is the kit I’m going to be taking with us to Toronto and mainly because right now I feel like my skin needs a little extra TLC. This set has great basics like the Purifying Cleanser and Hydrating Day & Night Cream, but also packs a punch with the eye serum I mentioned earlier and the Volume Defense Wrinkle Serum. I also like that it comes with two of the Dual Phase Skin Reviving Treatment Pads. I actually got one of these in my monthly probiotic shipment from TULA (when you are on a subscription, you get a sample product to try every month too!) and it really was like a mini facial. Even though I work with a couple of medical spas for my day job, I don’t get in there to get much in the way of facials for myself (I do keep up with my Botox though!). So, again, these are a great way to take a treatment with you, without adding too much to your makeup bag. 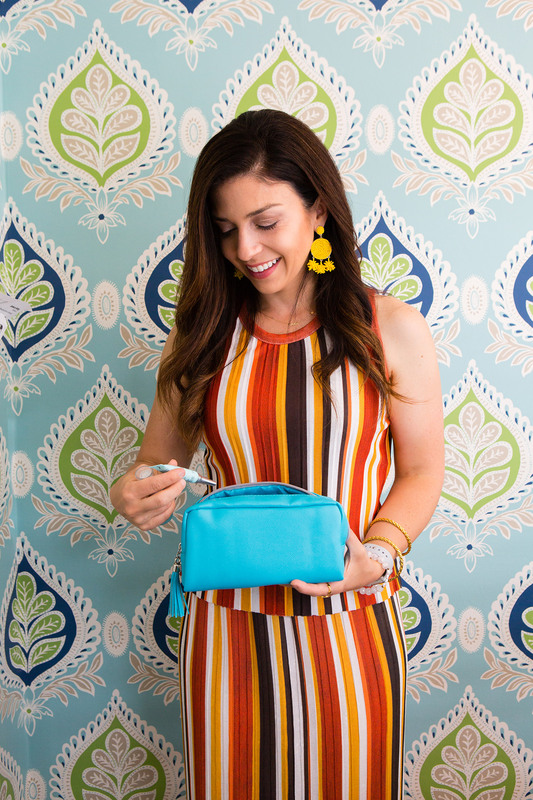 You can also make your own set, or restock either of these by checking out all of the products that TULA has in travel size – and it’s a lot! And don’t forget to use the code NINARAND to get 20% off your order site wide!